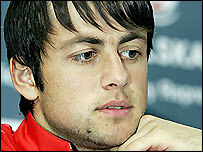 Arsenal manager Arsene Wenger has confirmed Poland goalkeeper Lukasz Fabianski will join this summer. The 22-year-old is joining the Gunners from Legia Warsaw. "That will be done," Wenger told the club website. "He will be our new keeper. He will join next year, be in the squad and compete for a position. "He is one for the future. We have identified him as having all the qualities to challenge and be one of the future great goalkeepers." The understudy to Celtic's Artur Boruc in the Poland national team will join Jens Lehmann and Manuel Almunia in Arsenal's keeper ranks. Lehmann recently signed a one-year contract extension and Almunia is pushing the 37-year-old German for a first-team place. Arsenal boss Arsene Wenger said: "I see Jens as a top-class goalkeeper and Almunia as a top-class goalkeeper, so it will be a battle at some stage because Almunia has improved tremendously. "Jens is trying every day to make life difficult for those who compete with him. "That is very good because it makes those who are competing with him improve as well. The Gunners have also been linked with Hearts keeper Craig Gordon.